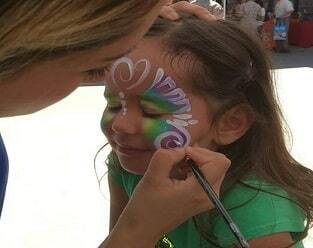 Let our Professional Face Painters dazzle your guests at your upcoming party! Face-paintings are great entertainment for guests of all ages and make for amazing photos and unforgettable memories! For safety and peace of mind, Our Facepainters use only non-toxic, hypo-allergenic, water-soluble paints. Perfect for events of all sizes, from small birthday gatherings, to school carnivals, to corporate picnics and festivals, our artists are sure to impress with their amazing designs. In addition to group events, face and body painting can be added to enhance halloween costumes and makes for incredibly creative professional photo shoots! Need more guests painted or shorter wait times? Check out our Airbrush Tattoos & Body Art! Tattoos take about 1/3 the time of Premium Facepainting! Minimum space: 10l x 12w x 10h.